1/3 cup honey or Virgin & Aged Coconut White Balsamic Vinegar, gently reduced by half and cooled. Preheat the oven to 250 degrees. In a small bowl whisk together the olive oil and balsamic reduction or honey until thoroughly combined. In a large bowl, mix all of the dry ingredients except the cranberries. Pour the olive oil balsamic mixture over the oats and mix very well until all the oats and dry ingredients are completely coated with the mixture. 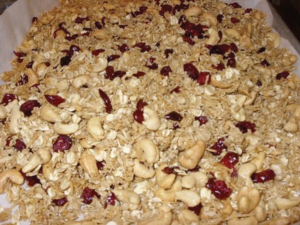 Spread the granola out on to a baking sheet covered in parchment and bake for approximately 1 hour until golden brown and fragrant. Cool completely and then mix in the dried cranberries. Store in a sealed container for up to one month.